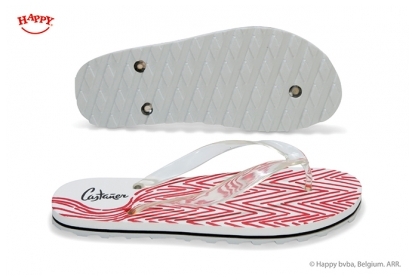 The Happy Foam Flip Flops are made out of high quality, skin friendly and solid EVA-foam, 100 % made in Europe. They have a large advertising surface and are very practical, low-cost give-aways. 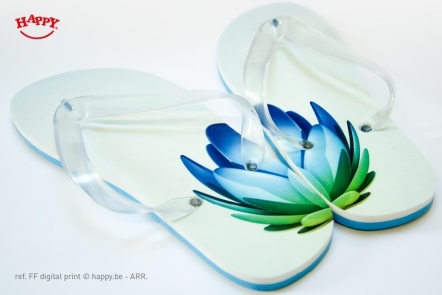 The Flip Flops are fully customizable; not only can you choose the size, colour and printing, you can even design your own card to add to the package. 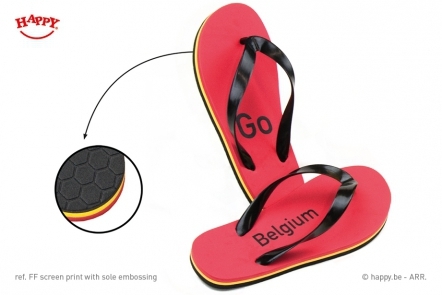 How to customize my own Flip Flops? a) Choose how many foam layers you wish. b) Choose how the bottom layer has to look like: plain, with relief (deep structure), embossing (surface structure) or with a logo cut out. 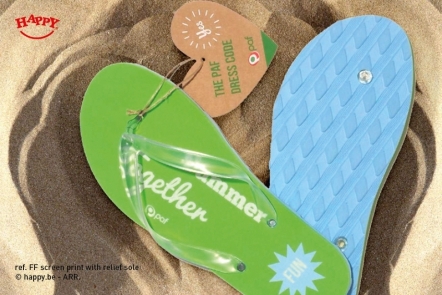 The sole of the flip flops is standard made out of two layers of 6 mm, glued to eachother: the top and the bottom layer. It's your choice to have them in the same, or in two different colours; all for the same price. A third, thin layer of 2,6 mm in between top and bottom layer is optional. The top layer is standard plain and ready to be printed with your logo. You can also add embossing (surface structure) for a soft massage feeling. If the top layer has another colour than the bottom layer, there will be a beautiful colour effect, especially if you choose for a logo cut out in the bottom. Pimp the sole of your flip flops with an extra coloured thin foam layer in between! For the bottom layer we offer four possibilites. You can choose for a plain, a relief, an embossed bottom layer or a bottom with your logo cutted out. Herewith some pictures of realised projects. Let them inspire you to create your own foam flip flops! 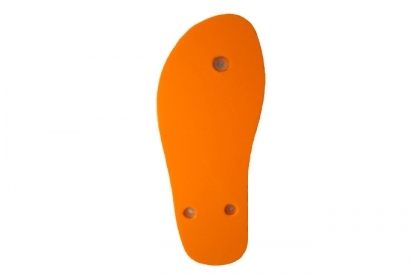 Example of an orange flip flop with plain bottom layer. The plain bottom is our standard offer. The skin soft EVA foam is very comfortable for your feet. Be careful: this plain bottom is not suitable on wet surfaces. 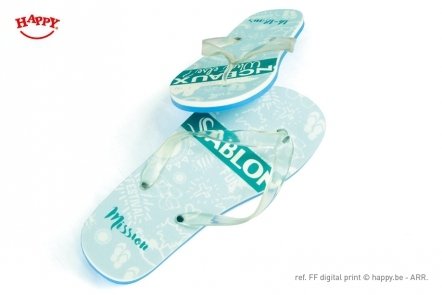 This is a white foam flip flop with digital screen print. The sole consists of 3 layers incl. a thin layer and a relief bottom. The relief bottom has an anti-slip function. Your customers will be safe and sound on their holidays, in the sauna or the spa! Top and bottom layer have a different colour. In the bottom there's a logo cut out, which gives a beautiful colour effect! With your logo cutted out of the bottom, your clients will spread around your message while walking in the sand. Thanks to these flip flops your company can be traced. Much more efficient than Hansel & Gretl! We offer a wide range of eva-foam colours, fully tailored to your wishes. Since we value fast delivery of our flip flops, we selected 8 standard colours, which are available in stock. To make the perfect match with your logo, there are more than 300 special or customized colours to make your Happy giveaway as personal as you want. 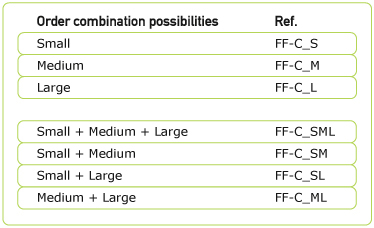 Tip: you can choose a different standard foam colour per foam layer at no extra cost (see also step 2.Sole). We have more than 300 foam colours which are not in stock. A minimum quantity has to be ordered. Send us the details of your desired pantone colour to find the match in our colour line. If you want to know the minimum quantity order of the flip flops, please contact us. 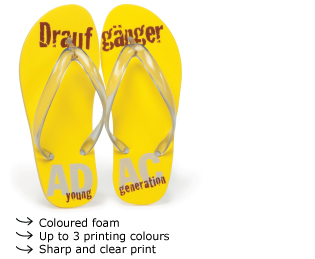 You can choose another foam colour to perfectly match the flip flops with your logo and design. If it's a colour that we have never used in foam, a lab-test will have to take place. This has an effect on the delivery time. Every flip flop exists of a foam sole with a plastic toe strap. 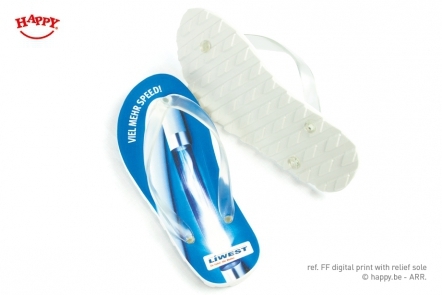 Standard we manufacture the flip flops with transparent (colourless) or black toe straps. However, from a minimum ordered quantity of 3000 pairs it is possible to make them in any pantone colour. Note: it's not possible to print on the plastic toe strap. We offer 3 different flip flop sizes. Each size covers three shoe sizes. 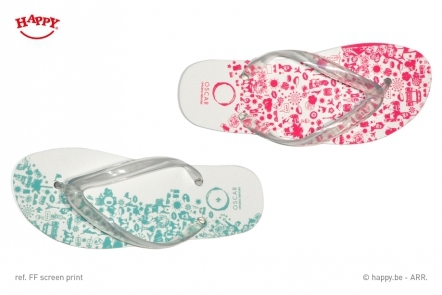 You can choice one flip flop size or combine sizes to reach your MOQ of 250 pairs. The possibilities are shown underneath. Keep in mind that the mix you want, especially with the larger sizes, will have an impact on the amount of material and thereby on the price. Would you like to go for the standard plastic bag, or do you like to give a personal touch to your promotional gift and add a customized card? - One flip flop pair per transparent plastic bag. On the backside of the bag a size label is shown. - One flip flop pair per transparent plastic bag + a customized card. A customized card in the flip flop package is like the cherry on your cake. Ask for our card template and make your design! Do you opt for one print film or more? Your choice has an effect on the way your artwork will be positioned, and on the price. Herewith we will explain it to you with examples. Usually we use one and the same film to print on the three flip flop sizes. That means that you position the logo on reference size layer S and that the logo will be positioned a bit differently on size layers M and L.
If you want to have your artwork positioned in the exact center of each flip flop size, you need a different film for each flip flop size. Once you have gone through all the steps and made your choice, fill in the price quote to ask for a tailor-made offer. With the order you will receive our flip flop template and detailed guidelines, enabling you to make a print-ready design.